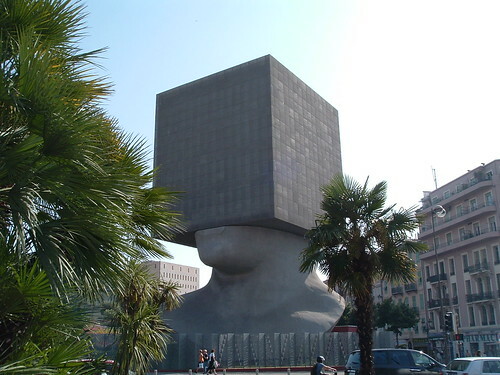 There is a huge and strange, cube shaped human head sculpture in Nice, France which is actually a seven (7) storied building. As per Emporis it is the first monumental habitable sculpture in the world. Officially named La Tête au Carré (The Square Head) it is a brain child of Sculptor Sacha Sosno and Architect Yves Bayard. 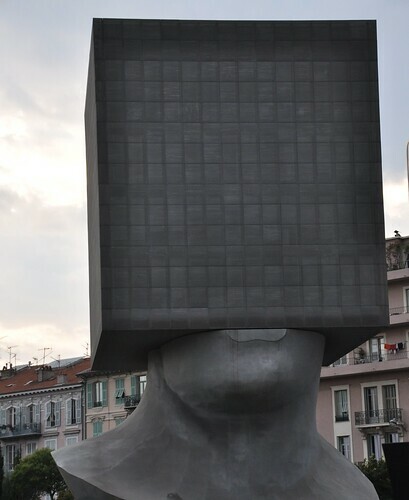 Yves Bayard and his partner Henri Vidal had for many years (1985) planned to convert the idea of Sacha Sosno into reality by building a giant "Square Head" which could house any building, commercial or administrative. They finally got a chance in 1997 when the city of Nice selected their design for administrative office of Bibliothèque (Library) Louis Nucéra which was to be located near the Museum of Modern and Contemporary Art (Musée d'Art Moderne et d'Art Contemporain). 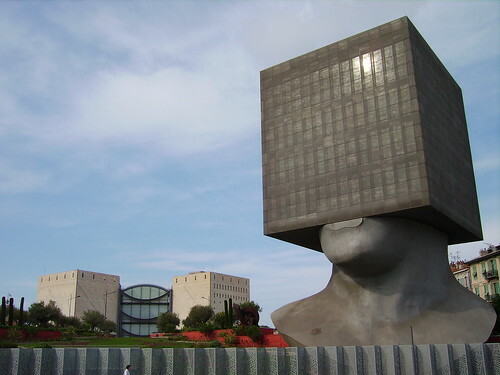 Opened on June 29, 2002, the library consists of two separate buildings; the "Square Head" Sculpture which houses the library administration and the Bibliothèque Louis Nucéra which is buried under the Promenade des Arts, and its entrance is through the Place Yves Klein, Traverse Garibaldi (see in Google Street View), on the other end of the Promenade. It is however understood that the library can also be accessed through the head. (Note: This needs confirmation.) While the library is open to public, the entry to the head is restricted. The sculpture building is 30 metres high, has 7 floors, (3 in the neck and 4 in the cube) and accommodates 40 administrative staff members. The cube measures 15 x 15 x 15 metres. The entire framework of the building is made from aluminium and is covered with finely perforated aluminium mesh so that no one can see the inside from outside, but conversely, the staff can view the outside. It has been given a matte light grey finish to blend with nearby Museum. Many of the locals are not very happy with the giant head and think that it is ugly; however it is a major sightseeing spot for the tourists.